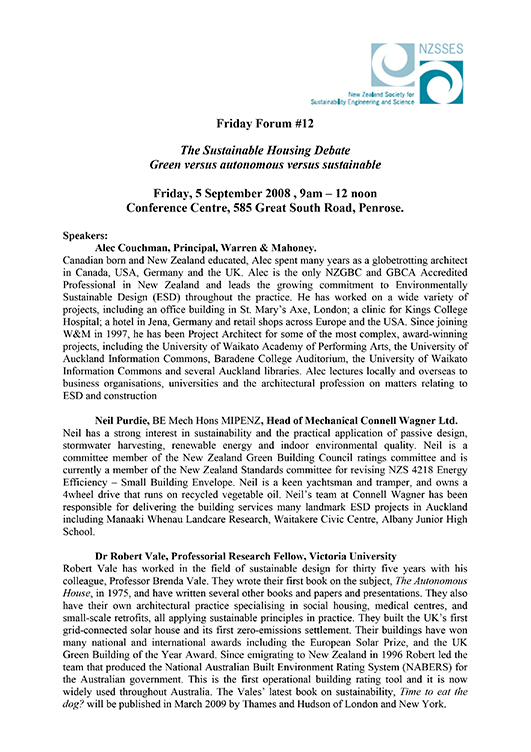 Beyond sustainability Given N.Z.’s relatively mild climate and generous solar exposure, the objective of new sustainable housing should be to provide economically affordable, environmentally sensitive, culturally appropriate and socially responsive structures that have a nett benefit to the environment. These houses will extend the Triple Zero concept to produce more energy than they need, be self sufficient in water supply and process all their waste on site without concerted tenant/ owner interaction. Avoiding Pitfalls in the quest for Sustainable Housing In New Zealand the opportunity to design housing for zero water and energy use is practical and achievable provided the over all strategy is consistent. Potentially mixed use developments combining work and residential provide logical benefits. These types of buildings fall between the cracks of planning and building legislation. Furthermore the fragmented approach to legislation and commercial factors are leading to conflicting solutions, which may have unrealised implications. The solutions may require a radical rethink of building codes and standards that currently “pigeonhole” buildings and systems. Here’s one I prepared earlier… An autonomous house obtains the services it needs for its operation from its immediate surroundings. It obtains its energy from renewable sources, it collects all its water needs and it deals with its own wastes by turning them into resources. Four completed projects dating from 1993 to 2005 show how the ideas of autonomy can be applied simply in a single house, in a small settlement and, more importantly, as a retrofit to existing houses. Two of the projects shown are in the UK and two are in NZ.